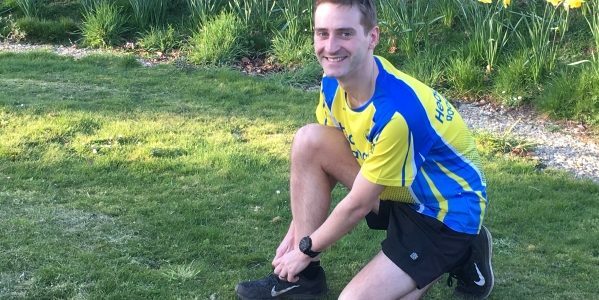 The super-fit dad-of-one who works for Oxford Health, has already nailed the 26.2 mile distance at last weekend’s Manchester marathon in a personal best of 3:05:47 and now has his sights firmly set on this Sunday’s Brighton marathon. In all Alex will be running an exhausting 270 miles in aid of the charity Papyrus which helps young people at risk of suicide. And he is more than half-way to raising his £5,000 target. The 33-year-old decided to take on the challenge for that cause due to his personal experiences. He explained: “In my work as a consultant psychiatrist I look after people who are at risk of suicide, and who have been bereaved by suicide. Alex, who works at the 20-bed female inpatient Ruby Ward at the Whiteleaf Centre in Aylesbury, added: “My mum chose the charity because our family has been affected by suicide and I have too outside of my family, which both had a huge impact on my life. “The loss of those people was devastating but ultimately lead me to do what I do now as a consultant psychiatrist. Looking after people who have been affected by suicide or are at risk of suicide is emotionally challenging, difficult, complicated and worrying, but it’s also incredibly valuable and rewarding. “I have turned my own experiences into helping others. I’m doing these races for people like them. And I’m doing for the team, as well. They’ve been through hard times too and have been incredible in supporting me with this fundraiser. What makes Alex’s resolve all the more impressive is that only three years ago – shortly after he and his doctor wife Suzanne welcomed their first-born son Sam into the world – he couldn’t even run around the block let alone a marathon. “Like everyone else I started with one mile at 10 minutes and that was exhausting. It just takes practice and then your body allows you to go further and further. Alex is a member of Headington Road Runners. He’s ticked off the Blenheim 7k and the Oxford Half (twice) in his local ‘to do’ list as well as 50 park runs and various other marathon events. Now there’s no stopping him and he’ll be doing his third marathon for Papyrus in Milton Keynes on May 5 followed by his fourth in Liverpool on May 26. After racking up those 104 marathon race miles – hopefully in a 7-minute mile pace – he’ll turn his attentions to the serious business of three ultra-marathons in this summer’s Threshold Trail Series. These endurance races cover a minimum double-marathon distance and take between 10 and 12 hours to complete. Each one is a unique and can be unpredictable as they are off road and usually on hilly national park trails. The Race to the Tower is 52 miles across the Cotswolds on June 8, followed by the the same distance in the Race to the King across the South Downs on June 22, and then the 62-mile Race to the Stones across The Ridgeway to Avebury on July 13. Alex said: “There’ll be a lot of preparation. It’s not just about being fit but you also have to prepare for the unexpected and be mentally resilient.